Orlando / Winter Springs – High School students participating in a seven-week summer program designed to expose them to opportunities in S.T.E.M. career fields recently toured the UCF Business Incubators in Winter Springs and Research Park in East Orlando. The Altamonte Springs Science Incubator Internship Program (AS21), in cooperation with Seminole County Public Schools is in the second year of existence. The program provides juniors and seniors in Seminole County Public High Schools – at least 16 years of age – with a dynamic educational experience working with Central Florida organizations to help further their interest in STEM related fields. After a presentation by UCF Business Incubation Program Director Gordon Hogan and tours of the facilities by the site managers, clients of the incubator sat down with the students to engage in an informal dialogue. “The students in the AS21 internship program have been visiting with several large participating organizations in the area. However, this trip provided a unique experience by exposing the student interns to starting a business while mingling with entrepreneurs and innovators in the S.T.E.M. fields,” Hogan said. Aileen Giraldo, S.T.E.M. Outreach Coordinator for the City of Altamonte Springs also accompanied the group on the tour. She detailed how the interns have toured some of Central Florida’s largest companies and experienced hands on learning activities with industry leaders in S.T.E.M. fields. The UCF Incubation program provided the student interns with some useful insight on how to better position themselves for opportunities in emerging S.T.EM. fields once they graduate. “The students said they gained valuable tips and advice at the Incubators and the close, personal back-and-forth discussions with entrepreneurs was both enjoyable and inspiring, Giraldo said. Technology companies represented at the Winter Springs and Research Park incubators were as follows: AceApplications, Altra Systems, CAVEAT Engineering; Design Launchers and Ninjaneer Studios. The UCF Business Incubation Program is a member of the Central Florida S.T.E.M Education Council whose goal is to collaboratively coordinate S.T.E.M. education efforts to prepare pre-college students to enter technical fields of study and pursue employment in Central Florida’s high-tech workforce. 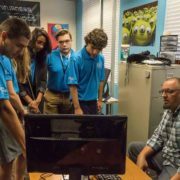 Photo ID #1 – AS21 intern students received a presentation by Joe Rosa, principal / director of Ninjaneer Studios, a digital creation firm in the Winter Springs Incubator. The AS21 Internship Program acts as an extension of the high school curriculum with the goal of increasing the number of Seminole County Public High School graduates who pursue a career in S.T.E.M. (Science Technology Engineering Math) related fields. The program is designed to improve the understanding of these fields, sharpen problem solving and collaborative abilities and develop a variety of workplace skills.